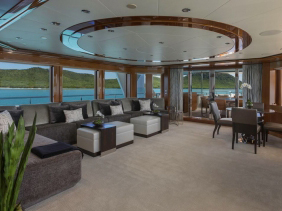 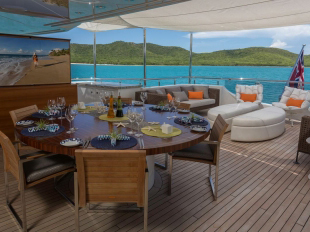 Motor Yacht Aquavita, a six-stateroom yacht recently underwent a multi-million dollar interior and exterior refit. Her interior and exterior was totally transformed with custom furniture and finishes; the sophisticated penthouse style decor also features two exterior balconies on the bridge deck for private relaxation and an elevator from the lower guest deck to the bridge deck for ease of access; an 8-foot extension was added aft of the bridge deck and the owner has provided every conceivable amenity to ensure the highest standard of luxury, including a 10 person Jacuzzi, and four dining areas that can accommodate 12 guests. 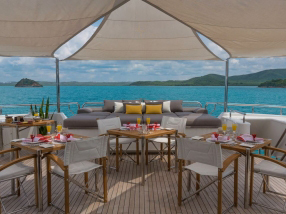 The Yacht operates in Central America and Mexico during the sumer months and are now available for charter in the Florida and the Carribean, accommodating 12 guests in six cabins.